Did you ever play Rags to Riches? I realize this list spans the ages, it’s a top five computer games of all time list. These are my favorites. I want you to note #1… Rags to Riches. 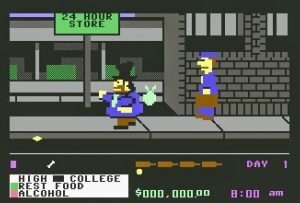 I bought Rags to Riches in I’d say about 1987 for 99 cents at Software Etc in the Santa Monica Place. It was part of a collection of games from a company called Value Ware. The other two games were Algebra Dragons and some Egypt tomb thing I think. I played the other two games like maybe once each, I payed Rags to Riches for hours and hours and hours and hours. When I discovered emulation in the late 90’s, I played Rags to Riches for hours and hours and hours and hours again. Thanks to the magic of emulation I was able to “finish” the game (it dosn’t really have a finish). Why do I love this game so much, I mean it made #1 in my top five. Well it’s because it’s so f-ing original. You play a hobo who needs to get a haircut, find a job and move up in the world. The goal of the game is to make a million dollars, but nothing really happens when you finally do that in the game. How’s that for real? The graphics give the game a feel all it’s own, This was obviously a single person project that simply did not receive the sort of press it deserved back in the 80’s. The guy who made it is named Bob Keener who I can’t find any info on. If he’s still alive, I’d like to shake his hand and tell him how much his game meant to me over the years. I mean, I’v been through thirty-one years relationships, jobs, careers, training, schools, births, deaths, happiness, sadness… life stuff, and through it all I’ve always had a copy of Rags to Riches to remind me that it’s all about getting enough to eat, a place to sleep and a haircut if you want a job. I think a lot of my reasons for taking a more Taoist outlook may be a result of the Rags to Riches influence. Geez, that’s a lot for one little game eh? Skid Row Joe, programed by me in my spare time last spring. 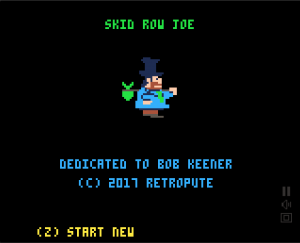 Anyhow, I love this game so much that I created a tribute game with the Pico-8 Fantasy Console that is my version of Rags to Riches that I called Skid Row Joe, and is available on this very site in the Retropute Games Section. Pico-8 deserves its own post, and I will do that in the future for sure, but for now go ahead and play some Rags to Riches or Skid Row Joe because you can. ← Tiny Arcade – Mr. Arcade is here! I read your article about Rags To Riches videogame. I was surprised because that was one of my favourite videogames in my infancy. Did you find anything more about its creator Bob Keener and Melody Hall Publishing? Is he dead or what? I would like to contact him to tell him thanks for the great hours of fun with his game.. Thanks so much for responding to the post. There seem to be a number of people who are trying to find some contact info for Mr. Keener. I would also love to know what happened to him, and more than anything, thank him for creating one of my favorite games of all time. It seems like in our currently well-connected world that we would be able to get more information about him. A person seems to know directly Mr. Keener. I tried to contact him, but he never answered. Maybe you would be more lucky. That’s a hot lead!!! I’ve never seen anything about anyone knowing him. I’m going to follow up. I love that he wanted to call it Bums, so cool. you are welcome!!! It would be grateful if you could find him and post an interview… 🙂 If you want, I can send you what I found at the end of my search (a possible facebook profile of “our” Bob – but he never answered me). In case, contact me by email for that info! I would also ask you if you know something about the possibility that a “real” end of this game exists. In an italian forum, someone told that reaching 9.999.999$ the end games with our guy without the bag and with a tie, and a final message appears. Also, they told also that there could be an interview with Bob Keener on the Washington Post (!). How I imagined the future when I was ten years old. Michele on Did you ever play Rags to Riches? greentiger90402 on Did you ever play Rags to Riches? Davide on Did you ever play Rags to Riches?